But you'll be able to get hands-on with a downloadable demo before the big day. It's been a busy year for Insomniac. Last year this time the company was putting the final touches on PlayStation 3 launch game Resistance: Fall of Man. 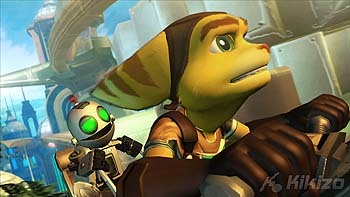 Now the team is getting ready to finish work on its next game, the first Ratchet & Clank for the PS3. In a post at PlayStation.Blog, Sony's Greg Phillips writes that Ratchet & Clank: Future Tools of Destruction will be out in the US on 30 October - a one-week delay. Sony has since confirmed with Eurogamer that the game will be in Europe in early November. The delay may be a slight disappointment but there's a plus to the story. In Phillips' post, the Sony line manager confirmed that the company will have a playable demo available for the game, based on the version that was on display at this year's E3 event. The demo, which is based on the Metropolis level, will be up on the PlayStation Network by 11 October in the US and around mid-October in the UK.